In their daily struggle for survival, herbivores are faced with several challenges. They need to cope with the risks imposed by their plant-based diets, such as the fiber present in the cell walls and plant secondary compound concentrations (i.e., toxins), both of which decrease the nutritional quality of the plants, and they must avoid becoming food themselves. Because these risks usually occur simultaneously in the herbivore’s environment, they are constantly forced to make tradeoffs between the acquisition of energy and nutrients from food and refuge from predators. Our objective in this study was to better understand how herbivores make tradeoffs among four risks when deciding where and what to eat – two associated with the food (plant fiber and toxins) and two associated with predation risk (the amount of cover and distance from a refuge). To do this, we conducted a series feeding trials with two species of rabbits that inhabit sagebrush (Artemisia spp.) 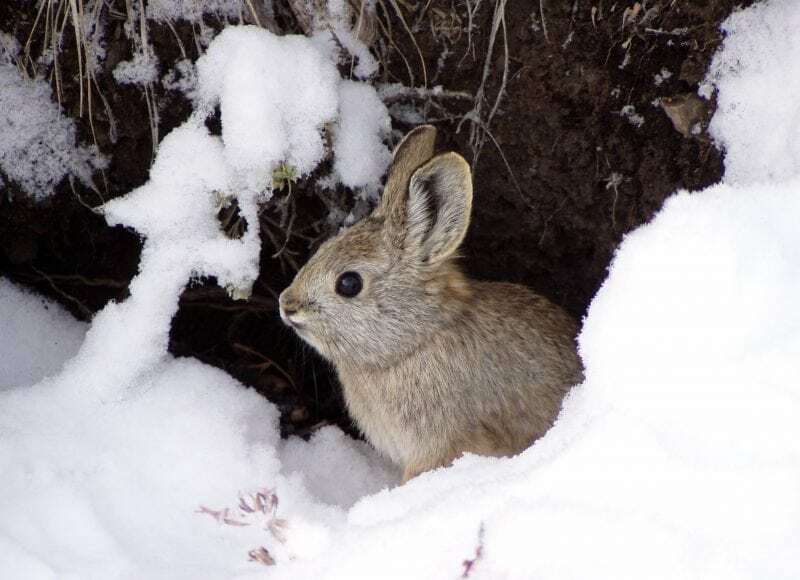 ecosystems in the intermountain western United States – the pygmy rabbit (Brachylagus idahoensis) and the mountain cottontail rabbit (Sylviagus nuttallii). The pygmy rabbit is a dietary and habitat specialist and is restricted to sagebrush-dominated landscapes. Most of the pygmy rabbit’s diet consists of sagebrush, which is high in digestible protein and low in fiber but contains high levels of toxins (i.e., monoterpens and terpenoids). Pygmy rabbits have a relatively high tolerance for sagebrush toxins, but a lower tolerance for fiber compared to other herbivores. Pygmy rabbits are also one of only two North American rabbit species that construct their own burrows and are a species of conservation concern. In contrast, the larger mountain cottontail rabbit inhabits a variety of landscapes, has a lower tolerance for toxins and higher tolerance for fiber, and does not rely on burrows for protection from predators. To quantify the rabbits’ perceived riskiness of foraging patches and the tradeoffs that individuals made between risks, we conducted a series of paired choice trials. During these trials, we presented the rabbits with a choice between two food patches that varied in the amount of fiber and toxins in the food, the amount of concealment cover, and the distance from a burrow. We measured food intake by the rabbits at the two food patches and modeled the relative ranking of the risks as a function of the difference in intake between the two patches. This ranking provided us with an integrated response to the four risks in the rabbits’ environment. We quantified tradeoffs between the risks as the ratio of the coefficients in the model. This ratio estimated the marginal rate of substitution between risks, or the rate at which the rabbits traded off one risk for another while maintaining the same overall risk level at a patch. The risk of predation was more important to the smaller, habitat specialist pygmy rabbits. They were willing to eat lower quality food to avoid foraging out in the open or farther from the burrow. On the other hand, the larger, habitat generalist cottontails were willing to forage in open areas, father from the burrow to obtain higher quality food. Through this research, we have shown how small herbivores make nuanced decisions when selecting foraging patches. These decisions require balancing the need to obtain high-quality food with avoiding predators. The next step in our research is to apply our model to sagebrush landscapes to create a map of the risks associated with food and predation. This type of map could be used to identify priority habitats for conservation and restoration strategies for pygmy rabbits and other species of conservation concern. These findings are described in the article entitled The balancing act of foraging: mammalian herbivores trade-off multiple risks when selecting food patches, published in the journal Oecologia. This work was led by Meghan Camp and Lisa Shipley from Washington State University.